My name is Marco Geurtsen, and I am an Electrical Engineer of the Advanced Control Team. 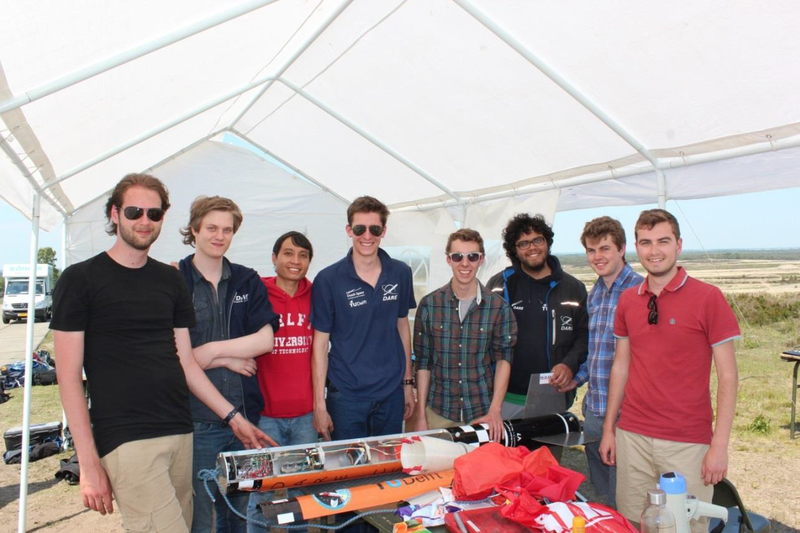 On Friday the 5th of June, the Advanced Control Team successfully performed a second launch with a CanSat V7 to test the sensors of DARE’s first actively stabilized rocket, the V7S. The Advanced Control Team is developing an actively stabilization system for sounding rockets of DARE. The objective is that by means of aerodynamic flight path stabilization, the rocket can reach higher altitudes and decreases the destabilizing effect due to gusts. We performed this second flight test to get more accurate data out of the sensors. In May we already got some good attitude data from the accelerometers, gyroscopes and magnetometers, however the pressure sensors which is used to determine the altitude of the rocket did not work back then. We fixed that problem, and furthermore we were able to log all sensors at a much higher sample rate then in May. So the launch in June was pretty much the same as the one in May, we even used the same hardware, but the launch in June got more accurate data. Besides the improved data logging system, the ACT developed a Kalman filter and a GPS system which should be installed on the actively stabilized rocket. The Kalman filter is used to correct the sensor data, to ensure that the flight control software produces the correct gains required for the aerodynamic stabilization with the canards. The GPS should be used to have a better understanding of the flight trajectory of the rocket, which shall be post-processed after the launch with simulations of the flight. For the flight in June we implemented a fully 3D printed nosecone, to ensure that the GPS signals are not interfered. Previously all CanSat V7 rockets had an extruded aluminium nosecone, however these metallic nosecones are not handy in combination with GPS signals. Although the Kalman filter and the GPS system were fully developed on the computer, they did not work on the microprocessor of the flight computer. Unfortunately we had to cancel those two systems before the flight test, otherwise the entire rocket would not work. Nevertheless we still got incredibly good data from all the other sensors. The launch itself went again flawless, the same as in May. The ignition went without troubles, and the parachute opened exactly 13s after launch. Also this time the rocket landed nicely on its engine nozzle, hence there was hardly any structural damage. It is a shame that 3D printed nosecone broke in half, but that was due to the weak connection between two layers of PLA which is not designed for sideways impacts when the rocket hits the ground. Nevertheless the rocket is still in a good shape even after its third launch in its life time, setting a record for this CanSat launcher. A new feature which we implemented in the launch procedure, is an uplink between the launch box and the rocket via UART when the rocket is still in the launch tower. Via this connection we could monitor all systems of the rocket, until moments before ignition. This monitoring will be essential for the launch of the actively stabilized rocket, since this connection shall be used to initialize the flight control system. Furthermore this connection can also act as a flight termination system, since it is able to completely shut down the rocket if it is still in the launch tower. Right now all flight tests are completed, and our next and final objective is to launch DARE’s first actively stabilized rocket. Right now we plan to launch this in November of 2015, and although it seems that there is still quite some time available, we shall have to work again hard to finish the job. I believe that the Advanced Control Team is the most advanced team within DARE, who shall not give up to finish the system, and shall ensure that the system we produce shall guide DARE in a safe and stabilized manner into space once.